She just delivered your little bundle of joy. Now it's your turn to deliver with SuperJeweler's stunning push present jewelry collection. Unlike labor, this push present won't hurt, except maybe a tiny bit in your wallet! Each and every tenderhearted piece in our push present jewelry collection is elegantly crafted to dazzle your new mommy at prices which will dazzle you. Your family just grew by one, so save those extra expenses for diapers and shower her in diamonds for less with SuperJeweler's push present jewelry options. You have a lot of options when considering a push present. Jewelry is a lasting gift. 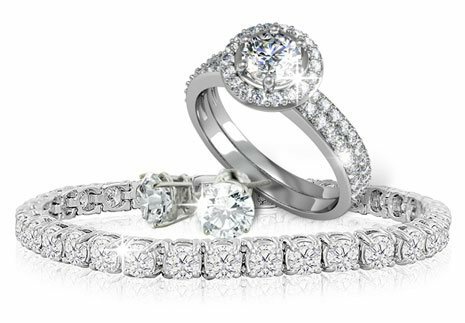 Our diamond jewelry collection, including halo engagement rings, diamond stud earrings, diamond necklaces and diamond bracelets, is far from the only option when shopping for push present jewelry. The doting new mommy has forever been changed. The new addition to your family has been etched in her heart and soul. She will forever carry an undying love and admiration for your new baby and will adore a gift symbolizing the new love she now holds in her heart. Gift her with a truly meaningful initial necklace or initial bracelet, displaying the initial of your new addition, which will hang next to her heart for years to come. Another sentimental and tender option from our push present jewelry collection is the gift of your baby's birthstone. Now that you have a new baby, you have enough to worry about. Skip that trip to the mall and celebrate your growing family by shopping in the convenience of your own home with SuperJeweler's warmhearted push present jewelry collection, designed with love in mind.